Generally the Fuerteventura roads are very good. We don’t get the weather here that ruins roads in the UK and northern Europe. By that I mean the constant freeze/thaw in the winter that breaks up the surface. I enjoy driving here as the roads are interesting with lots of bends so you don’t have the chance to get bored. Then there is the scenery to keep you interested as you drive through too. One of the great things about the Fuerteventura roads is that you never get stuck in traffic jams. I remember driving through the capital, Puerto del Rosario, during “rush hour” once. The traffic was awful as I was the third car back getting on to the main roundabout and delayed by 20 seconds. How awful! There are no motorways here although they are building a dual carriageway that will go from the north to the south. When I say building, they started it years ago and keep running out of money so it stops again. There are some sections completed in the south of the island. As well as tarmac paved roads there are plenty of unmade “tracks”. These often provide access to the beaches. When you hire a car here you sign the agreement which says you will not take the car on unpaved roads. This naturally doesn’t stop most people from doing it. In fact, in the past, I have taken hire cars down tracks that I may think twice about taking my 4×4 down! 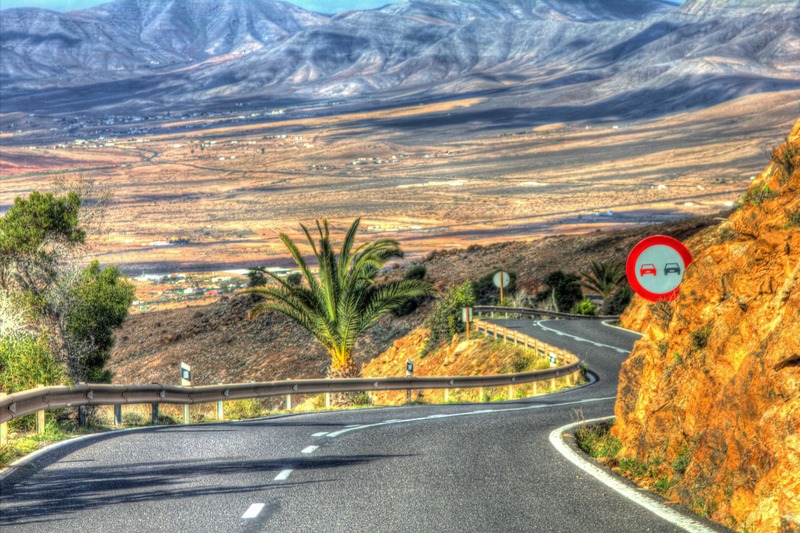 Fuerteventura Driving Timelapse – the north in 6 minutes! Over the last years I have taken videos from the car while driving. I have put these together in this video which contains various timelapses taken from the car.